Allyson has been running since she was 11, and has completed several international marathons in her career. 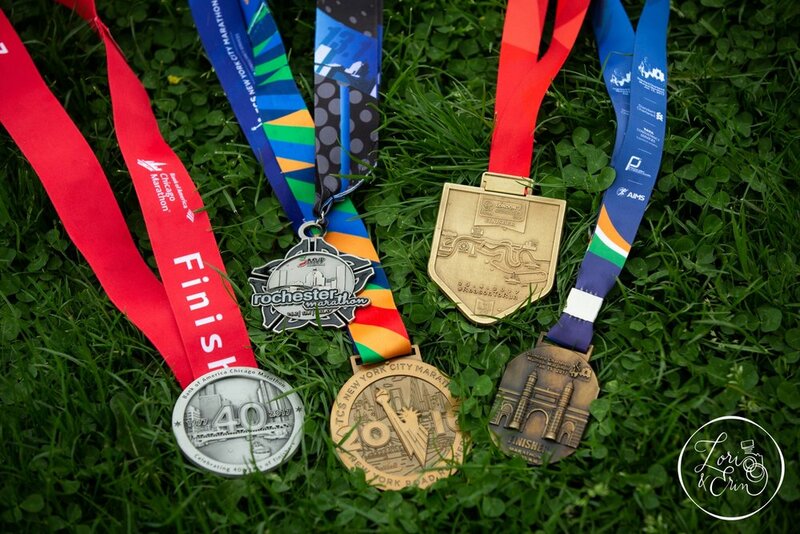 Some of her favorites have included New York City, London, Mumbai, and of course, the Rochester Marathon! During our session, her son enjoyed putting the medals on, taking them off and then repeating the process. He was also a fan of climbing on everything he could find. He was just a happy two year old who enjoyed exploring the canal path in Pittsford. When I caught the moment in the black and white photo below, at first I thought I had missed it -a protective mom holding his hands to keep him safe as he jumped and played. But when I gave it a second look, it's really about transition. It's about how he's almost to that point where he will be more independent, and less reliant on mom. Isn't that what toddler-hood is all about? It's only a split second, but it kind of sums up parenting. So parents - take the pictures, and hold on while you can, because one day they let go with both hands.